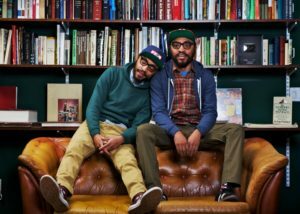 The identical twin comedians known as The Lucas Brothers have cultivated a niche audience with an animated television series, movie roles and a Netflix stand-up special. But before all of that, Keith and Kenny Lucas were philosophy majors in college, and their love of the subject permeates much of their comedy. We recently sat down with them and asked which philosophers they think are most relevant today. Here are the philosophers and works they recommended. “A History of Western Philosophy” by Bertrand Russell: Published in 1945, Russell’s “A History of Western Philosophy explores the ideas of major thinkers from Plato to Immanuel Kant. Russell “pretty much anticipates the dichotomy between liberals, committed to science and individualism, and conservatives, committed to the conservation of order and stability,” Kenny said. “On Liberty” by John Stuart Mill: Mill was a British economist, philosopher and ethical theorist, and in his treatise, “On Liberty,” he explores the boundaries of self-sovereignty. Mill delves into “the necessary and sufficient conditions” for individual liberty and how a government can encroach on those freedoms, Keith explains. “Ethics of Identity” by Kwame Anthony Appiah: In the same vein as Mill, Appiah, in “Ethics of Identity,” focuses on collective identities and how they can restrict people’s ability to develop as individuals — but from a modern point of view. The book was published in 2005. “He really stresses the importance of allowing people to have the freedom to create their own identities,” Keith explains. “The Origins of Totalitarianism” by Hannah Arendt: Arendt’s 1951 book analyzes the roots of Nazism and Stalinism in the 20th century. The recent rise of nationalism makes this an important read for our times, Keith and Kenny said. “The Metaphysical Club” by Louis Menand: This book, which won a Pulitzer prize in 2002, covers the development of pragmatism in American thought, beginning with the Civil War. The “Metaphysical Club” was the name of a group of philosophers — Oliver Wendell Holmes Jr., William James and Charles Sanders Peirce — who often met to discuss their ideas. Those men helped shape a way of thinking that moved Americans to focus on practical solutions, in part to reduce violence, and away from “over-relying on beliefs that you can’t prove,” Kenny said.